If it's above 70 degrees outside, it's too hot to leave your pets in the car. Even with a window cracked open it can quickly reach deadly temperatures inside! Early signs of heat stroke can be observed in dogs left in hot cars for as few as 10 minutes. Advanced stages may be reached by the 15-20 minute mark. Heat stroke can be the serious and often fatal result of a dog's prolonged exposure to excessive heat. If your dog begins to exhibit signs of heat stroke you should soak with cool water (not ice!) down to the skin, immediately call us, and bring him directly to the office! We know most folks know better than to leave their pets alone in the car, even for a few moments. But do you know what to do if you see someone else's pet left alone? Take down the car's make, model and license-plate number. If there are businesses nearby, notify their managers or security guards and ask them to make an announcement to find the car's owner. Get informed: Learn your town's laws about leaving pets in hot cars now. Get ready to call for help: Gather the essential telephone numbers and have them on hand. You’ll want to have your local animal-control agency's number and the police department's non-emergency number so you can quickly report the situation. Keep these numbers in your purse, your car's glove compartment or programmed into your phone. Spread the word: Distribute The Humane Society of the United States hot car flyer, which spells out the dangers of leaving pets in parked cars. Order more flyers on animalsheltering.org. Get involved: Ask local store managers, shopping malls, restaurants and other businesses to post signs asking customers not to leave their pets in their cars while shopping, dining or engaging in other activities. 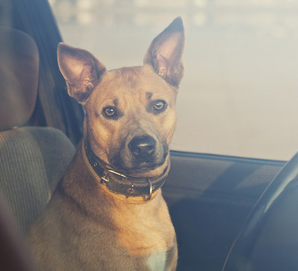 Speak up: If your town doesn't have a law prohibiting leaving pets in parked cars, contact your local representatives or attend a town hall meeting to start lobbying for one.